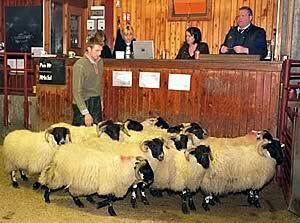 The Cumberland & Dumfriesshire Farmers Mart P.L.C. had forward 44 prime cattle, 23 over thirty month cattle, 4,245 prime lambs and 6,154 cast ewes & rams at their weekly sale at Longtown on Thursday 9th December, 2010. A plainer show of prime cattle was on offer and met a firm trade once again. Top price of 176.5p for a British Blue heifer from J. Magnay, Smallholms and purchased by Mr J. Mathers; Charolais 169.5p Hallburn, 168.5p Sceughdyke, 167.5p Hallburn, 165.5p Houghton House, 163.5p Hallburn; Limousin 167.5p Sceughdyke, 166.5p Hallburn, 165.5p (x2) Nirvana, 165p Hallburn. Bullocks to 171.5p for a Limousin from J.F. & I. Armstrong, Nether Onsett, 167.5p Hallees, 166.5p Dashwell Green, The Haining House and Nether Onsett, 163.5p The Haining House and Nether Onsett, 160.5p Hallees; Charolais 165.5p Sceughdyke, 160.5p Dashwell Green, 157.5p Sceughdyke. Top per head of £1,275.30 for Limousin from The Haining House, £1,223.78 Dashwell Green, £1,223.78 The Haining House, £1,156.38 Hallees; Charolais £1,257.80 Sceughdyke, £1,219.05, £1,181.58 Dashwell Green, £1,126.13 Sceughdyke. Heifers to £1,056 for Limousin from Hallburn; Charolais £1,053.13, £1,018.53 Sceughdyke. A small show of OTM cattle met a fantastic trade with all classes in demand, more could have been sold to vendors advantage. Top of 132.5p for Angus cows from T.W. & E. Tennant, The Shaws, other from the same home 125.5p, 104.5p and 99.5p; Blonde d’Aquitaine 123.5p Sceughdyke, 98.5p Hepplehill; Limousin 118.5p Waltonwoodhead, 114.5p, 103.5p Upperburnmouth, 90.5p Sorbietrees; Friesian 99.5p The Stubb and The Nook, 93.5p The Stubb, 91.5p The Nook. Top price per head of £1,062.10 for a Blonde d’Aquitaine cow from T. Armstrong & Sons, Sceughdyke; Angus £848, £753 The Shaws; Limousin £841.35 Waltonwoodhead; Friesian £672.53, £666.65 The Nook. A decent show of 4,245 prime lambs was forward, although many more could have been sold to advantage. The sale average was 174.3p with the SQQ (32-35kg) averaging 178p per kilo. The sale was topped at 237p per kilo for Beltex from Sorbie, top per head of £97.50 for Suffolks from Sceughdyke and Hallburncroft, others £91.50 Sceughdyke, £91.20 Tinnis Hall; Beltex £93.50 Harene, £92.50, £84.80 Sorbie; Texel £92.50 Cardew Hall, £92 Coytre, £91.50 Willimoteswick; Charollais £92.50, £87.50 Cardew Hall, £85.50 Sceughdyke; Half Bred £87.20, £82.50, £80.80 High Moat; Greyface £83.50 Cardew Hall, £82.50 Bush of Ewes, £79.50 Sceughdyke; North Country Cheviot £81.20, £80.20 Pilmuir, £79.80 Potholm; Blackface £77.80 Sorbie, £76.80 Bush of Ewes, £75.80 Boreland and Bush of Ewes; Leicester £77.50 Kirkland Green; Lonk £75.50 Bush of Ewes; Hill Cheviot £73.20 Skelfhill, £67.80 Commonside; Romney £68.80 Newington; Swaledale £67.80 Greystoke Castle, £62.20 Kirkland Green; Jacob £56.50 Newington. The 814 lightweight lambs sold to £70 for Texels from Westerley, £68.80 Hawthornside; Suffolk £64.50 Tone Hall, £62.80 Beachmenach; Blackface £63.80 Clonrae, £62.80 Haithwaite; Hill Cheviot £63.20 Linhope; Swaledale £59.50 Howburn; North Country Cheviot £59.20 Killean; Greyface £56.80 Newington; Charollais £55.80 Newington; Shetland £40.50 Tarnside House. Another excellent show of 6,154 cast ewes and rams were forward to a full ring of buyers and were £4 to £5 dearer on the week, especially for large ewes and plain ewes. The sale was topped at £115 for Texel tups from Waterside, £110 Rigg House; Leicester £108.50 Knarr, £98.50 Shatton Lodge, £88.50 Deadwater and Nilston Rigg; Beltex £100, £90 Waterside; Suffolk £86.50 Hallburncroft; Blackface £78.50 Milnmark, £74.50 Tone Hall; Border Leicester £78.50 Dodgsonstown; Cheviot £62.50 Crossibeg. Heavy ewes to £112.50 for Texels from Plenderleith, £110.50 Almagill and Blackhamilton; Suffolk £106.50 Coytre, £103.50 Allfornaught, £100.50 The Beeches; Half Bred £98.50 Stackbraes; North Country Cheviot £97.50 Carruthers, £89.50 Earlside; Leicester £96.50 Roachburn, £84.50 Brownleazes; Beltex £84.50 Low Farm; Charollais £84.50 Newbigging; Greyface £82.50, £81.50 Allfornaught, £80.50, £79.50 Tone Hall; Zwartbles £76.50 Ringliggate. Hill ewes to £85.50 for Cheviots from Allfornaught, £76.50 Mawbray Drive, £66.50 Naddle; Blackface £70.50 Crosskeys, £69.50 Nilston Rigg and Low Farm, £68.50 Shitlington Hall and Low Carry House, £66.50 The Nook and Brownleazes; Swaledale £62.50 Batey Shield, £58.50 Roachburn, £57.50 High Parkfoot, £56.50 Nunscleugh; Lleyn £59.50, £56.50 Gatehouse Cote; Shetland £32.50 Almagill.